"Did you ever look at your daughter?" Kino Lorber has debuted the official US trailer for the indie drama Sand Storm, and Israeli film which premiered at the Sundance Film Festival earlier this year. It's a drama set in Bedouin village in Southern Israel about a mother and daughter struggling to find their own way and break the rules of the society they live in. The film stars Ruba Blal-Asfour as Jalila, along with Lamis Ammar, Haitham Omari, and Khadija Al Akel. This won the Grand Jury Prize in the World Cinema Dramatic competition at Sundance this year. Our friend Tomris Laffly said the film knocked her socks off, adding that it's "a slow-burning and suspenseful emotional drama." This trailer hints at an outstanding film. As Jalila (Ruba Blal), a 42-year-old Bedouin woman, finds herself awkwardly hosting her husband's marriage to a second, much younger woman, she uncovers her young daughter's (Layla, played by Lamis Ammar) affair with a boy from her university — a liaison that's both forbidden and could shame the entire family. Emotions escalate when Suliman (Haitham Omari), Jalila's husband, decides to move in with the new bride and Layla refuses to stop seeing her boyfriend, even after her mother's pleas. Convinced that Suliamn will be supportive of her relationship, Layla pushes for a meeting between the boy and her father ­– eventually learning that she's been promised to another man. 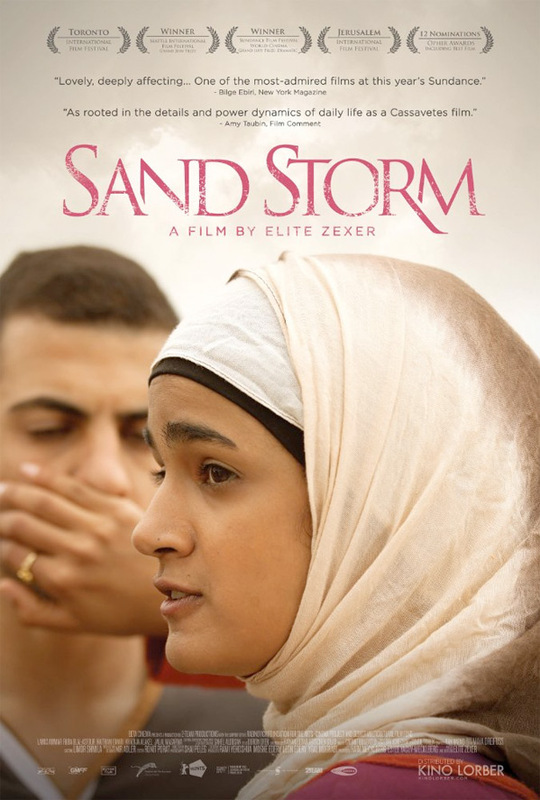 Sand Storm is written & directed by Israeli filmmaker Elite Zexer, making her feature debut after a few shorts. The film premiered at the Sundance Film Festival this year. Kino Lorber will release Sand Storm in select theaters starting September 28th. Sharia Law or whatever these people's excuse is NO excuse. Exactly David. Something has to change there, I can't expect their dealings as a culture. A very hard to watch trailer. As Americans it seems crazy and unfair. As Saudis it is just a part of everyday life (yes, I know it takes place in Israel). I try to keep from making super harsh judgement calls on other's cultures, but it is so hard to stay independent when you see such unfair treatment. I was feeling bad about how I was feeling about what I saw. Now I see my feelings are shared by a lot of folks here. I am not interested in seeing this at all. Just to think, in my younger days, I was interested in studying the religions of the world...life has told me all I need to know.